What Day Of The Week Was May 3, 1999? 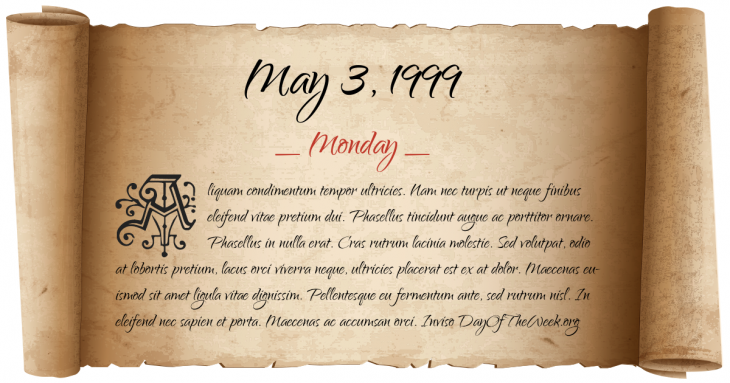 May 3, 1999 was the 123rd day of the year 1999 in the Gregorian calendar. There were 242 days remaining until the end of the year. The day of the week was Monday. A person born on this day will be 19 years old today. If that same person saved a Nickel every day starting at age 7, then by now that person has accumulated $236.75 today. The southwestern portion of Oklahoma City, Oklahoma is devastated by an F5 tornado killing forty-five people, injuring 665, and causing $1 billion in damage. The tornado is one of 66 from the 1999 Oklahoma tornado outbreak. This is the strongest tornado ever recorded with wind speeds of up to 318 mph.